Combining youthful exuberance with a sporty and sleek design, Kia Motors America (KMA) debuted the Kia KOUP concept at the 2008 New York International Auto Show (NYIAS) during a press conference at the Jacob K. Javits Convention Center. Illustrating the shape and evolution of future Kia vehicles, the simple yet bold and aggressive KOUP exterior is complemented by its realistic and sleek interior design. 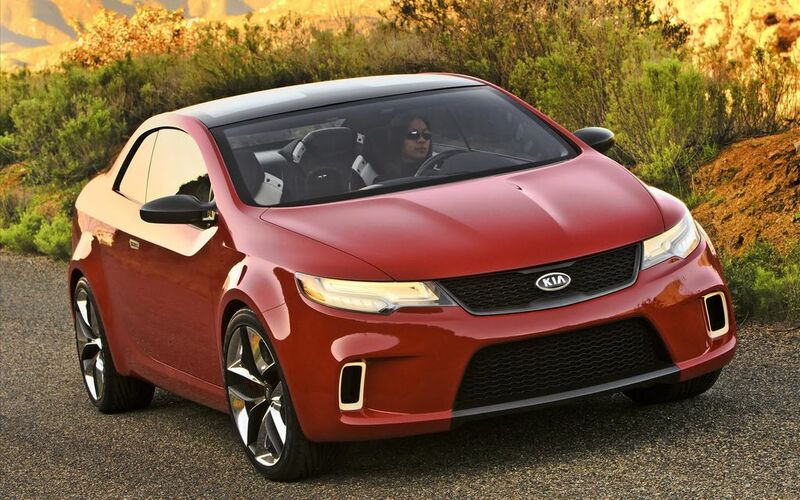 Originating from the Kia Motors America Design Center in Irvine, Calif., the Kia KOUP concept embodies Kia's philosophy of "Exciting and Enabling" with its balanced proportions and fluid design set to evoke an emotional driving experience. The KOUP features an uncomplicated yet dynamic wedge shape along its sides stemming from its glowing, carbon fiber and black chrome enhanced LED lamp lenses. 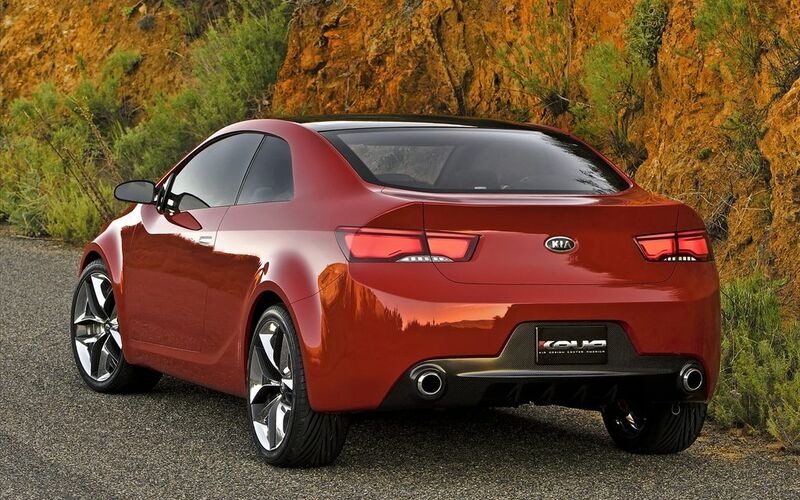 While the KOUP's overall form is simple and precise, it makes a design statement with positive tension created by a "swoosh" that swoops from the "C" pillar forward, down to the "A" pillar and flares all the way back around to the reardeck lid. A trailing horizontal lip along the deck lid tapers up toward the outer ends to meet up with the swoosh from the beltline. The rocker sill has a distinctive "check mark" shape and prominent wheel flares that give the KOUP a strong, lowered stance. The short overhangs and wide stance reflect its well-balanced and responsive character. No element of high-style design is missing in the Kia KOUP concept as illustrated by its greenhouse-integrated, panoramic-view glass with two panels extending from the windshield through the roof to the backlight, appearing as two parallel pieces of glass - similar to a fighter jet cockpit. Segregating the glass panels, an interior mood light runs the full length of the greenhouse. To further the performance-inspired appearance with sporty elegance, carbon fiber enhancements accent the KOUP's chin spoiler, lamp lenses, cowl panel, side-view mirrors, rear bumper insert and rear diffuser, while flashy twin wheel spokes include carbon fiber inserts paired with an open design to show off the Brembo® calipers and cross-drilled rotors. Conceived artfully and with graphic precision, the KOUP's interior hones in on the desires of auto enthusiasts from the inward lean of the dashboard and Supervision instrument panel, enhancing the performance-inspired driving experience to the custom-designed, race-inspired steering wheel in front of a three-gauge instrument cluster. Carbon fiber accents on the shifter plate and seat tilt-adjust mechanism reinforce sporty performance. Audiophiles and car enthusiasts alike will take heed of eight speakers, including large rear deck speakers matched to a juke box audio system, further harmonizing the driving experience. A built-in Bluetooth®-enabled navigation system with Map On Demand (MOD) is just the beginning of the telematics services. 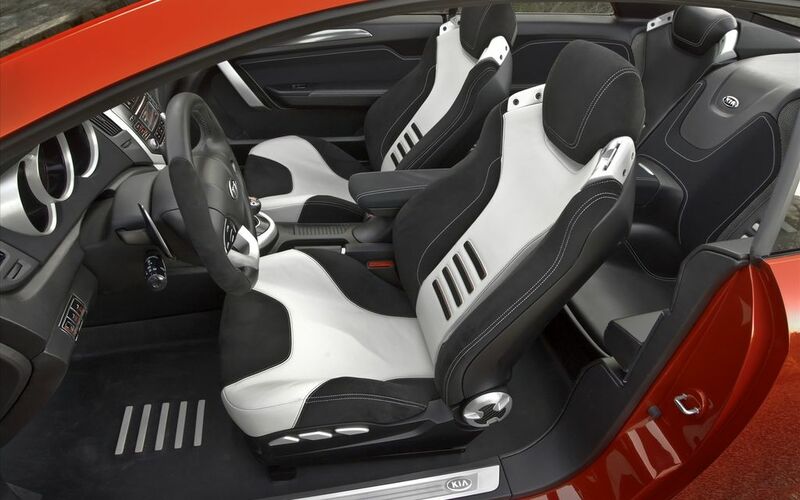 The Kia KOUP features a realistic interior design that integrates high-style materials, including rich and supple seat fabrics accentuated with concrete- and black-color trims. As a true driver's car, the front seats contrast the rear seats with opposing colors and patterning and horizontal, padded silicone bars occupy the seat backs for extra comfort. High-tech details are integrated into the interior, including convenient smart key with push button start, and a six-speed automatic transmission with steering column-mounted paddle shifters. Powered by a commanding 2.0-liter Theta II turbocharged engine producing 290 horsepower paired with a GDI (Gasoline Direct Injection) twin scroll turbocharger for greater power and efficiency, the KOUP delivers astonishing torque of 289 lb-ft at a low 2,000 rpm sustained to 4,000 rpm. By injecting fuel directly into the cylinder under high pressure using the Kia GDI system, the intake charge is cooled and combustion behavior is improved. Improved combustion assures excellent fuel economy and low emissions. Lower grille openings enable additional air intake for extra power. Built on a front-wheel-drive unibody frame, coil springs and stabilizer bars complement an independent front suspension featuring MacPherson struts and an independent dual link rear suspension to provide the optimal balance of ride comfort and engine responsiveness. An engine-speed-sensitive, power-assisted rack-and-pinion steering system adds the finishing touch for precise handling. In keeping with the KOUP's sporty essence, Continuous Damping Control (CDC) for quick movements and sharp turns paired with a sport-tuned, four-wheel independent suspension and strut tower bar offer a tighter grip for more spirited driving. The Kia KOUP concept features all of the standard safety features offered in Kia's regular production vehicle lineup including six standard airbags and a Tire Pressure Monitoring System (TPMS). Electronic Stability Control (ESC) paired with CDC helps to stabilize the KOUP for maximum contact with the pavement. The large 245/40ZR19 tires complete the KOUP's impressive package. Also included is adaptive front lighting and cruise control, adding to the KOUP's advanced safety technology.